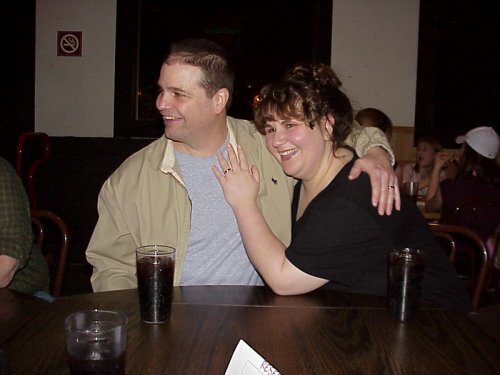 This is a picture of me and my husband, Mike,&bsp;on our wedding day in January 2004.&bsp; We met online.&bsp; His first wife had died&bsp;a little over two years before, and after working through his grief, he was starting to feel ready to date again.&bsp; I had graduated from college a little over two years before, spent a year doing national service with Americorps, finally had my own apartment and a budding career, and was finally feeling settled enough to date. When I think of all the little coincidences that brought us together, I am still amazed.&bsp; We lived less than a mile away from each other, but since we are both introverts and didn't socialize much, we probably would never have met without the power of the internet.&bsp; I had determined that the top age range I would include in my dating site searches was 15 years old than me (I was 27, so that made the top range 42).&bsp; He was 45, but had decided to lie and say he was 42, so he popped up in one of my searches.&bsp; I thought he was cute and sounded funny and intelligent.&bsp; What really drew me in was his answer to the question, "If I looked in your bedroom, what would I find? "&bsp; He had answered, "Probably the cat sleeping on the bedspread. "&bsp; A man who likes cats--who actually owns a cat rather than just tolerating them because he thinks it will win me over!&bsp; Yay! We started dating casually, with no intent to pursue a relationship.&bsp; I kept dating other guys from the dating site for about a month, until it just started to seem... not right.&bsp; Eventually I realized that the reason I was still going out with other people was because Mike worked weekends, and I missed him!&bsp; Five months after we started dating, he proposed, and three weeks after that, we got married.&bsp; It&bsp;seems sudden&bsp;when I state it that way, but we knew it was right.&bsp; Almost six years later, we still have strangers comment that we are the sweetest, most loving couple they have seen in a long time.